I know I don't do a lot of "food" posts here on Babblings, but as a mom I can appreciate when a restaurant puts an effort in to their kids menu. That's the case at Bob Evans! Yesterday night we decided to go out to dinner at Bob Evans and I know I've mentioned here before that it's a good family restaurant but for anyone who hasn't gone yet or never heard of it I thought I might share more details. So, what do I like about them? Well first of all look at the selections they have for kids! Usually kids only have 2-3 items to choose from and it's almost always chicken nuggets or pizza, etc. Here, they have turkey slices with mash and veggies or chicken breast with your choice of sides. Not to mention they have a whole bucket load of sides to choose from! Which means you can choose more than just *gasp* french fries! What's another great thing? 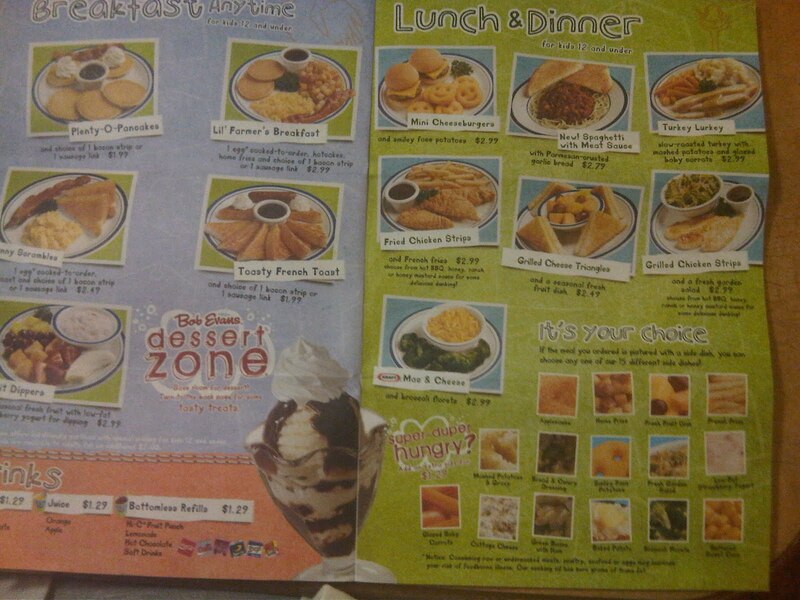 I think only parents will be able to appreciate this but..their whole kids menu is a coloring book! It contains 3/4 pages of fun activities for your kids. 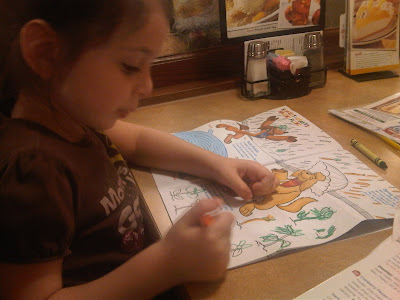 It helps keep them entertained and not completely embarrass you while you wait for your food. You KNOW as parents how frustrating it can be to get your kids to sit still for 2 seconds and I don't know WHY some restaurants don't think this small detail is important! So aside from being a great place to take your kids, they have some yummy homestyle food for you! My husband ALWAYS goes for this Pot Roast Sandwich that contains slow roasted beef, with carrots and onions on a sourdough bread and your choice of side. I like to mix it up a bit and have tasted everything from their chicken dinner to their pastas to their wraps. All of it is always delicious! And what's the cherry on top?? It's A-F-F-O-R-D-A-B-L-E! For a family of 3 we spent a little less than $30 INCLUDING dessert people!! 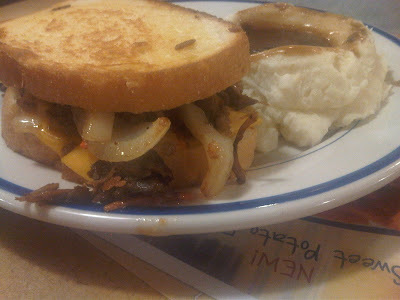 Go to www.bobevans.com to find one near you.